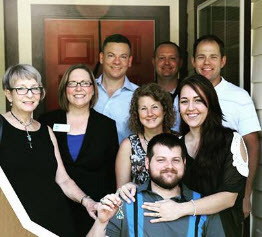 On Friday, August 12, employees from Pacific Resources Orlando office participated in a dedication ceremony to present the keys to a new ADA-compliant home to Brian and Victoria Arndt. The home was built with assistance from Habitat for Humanity of Greater Orlando and the State of Florida Mortgage Settlement Fund. Pacific Resources provided corporate sponsorship support for the home build and Pacific Resources employees volunteered to assist the Arndts with the four month long building project. In 2012, Brian Arndt was attending college while in the Marine Corps Reserves with hopes of one day becoming a pilot. He and Victoria were engaged to be married. On October 25, 2012 he was leaving campus on his motorcycle when another driver made an illegal turn and struck him. After a month in the hospital and a month in an inpatient rehabilitation facility, Brian was discharged and set to face his new life as a paraplegic at 22 years old. Brian and Victoria are now married and Brian is back in school working towards an engineering degree. Victoria was recently hired as a crime scene technician. As part of their path to home ownership, they have completed Habitat for Humanity’s financial classes, performed 500 hours of community service, and put their own sweat equity into building their new home.